Carrickfergus is a great but unusual song because, although it is undoubtedly an integral part of the Irish folk tradition, there seems to be no reliable reference to it before it was recorded by Dominic Behan in the mid 1960s. Behan said he had learned the first and third verses of the song from the actor Peter O’Toole, who considered it one of the best of the great Irish ballads. Behan claimed to have written the second verse himself. The mystery is, where did Peter O’Toole get the song from? Carrickfergus was played at the funeral of John F Kennedy Jr. in 1999. Carrickfergus is thought to have been based on a Gaelic song called Do bhi bean uasal which dates from the 18th century. Over the next two hundred years it may have resurfaced in various macaronic formats, in which English and Gaelic words are interspersed. This was sometimes done to create witty wordplay between the two languages but it could also simply reflect the fact that for many people, the two languages co-existed side by side. 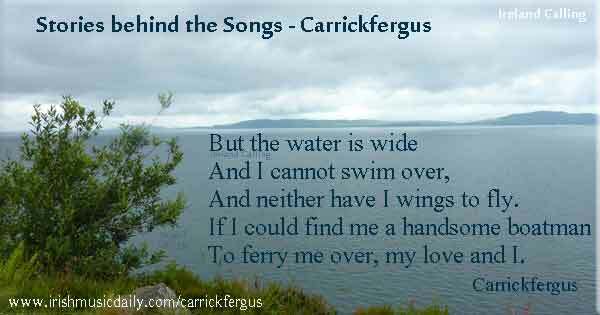 There are, of course, many versions of songs like Carrickfergus and the Water is Wide in which lovers are kept apart by a stretch of sea or river. However, prior to the 1960s, there was no known version of Carrickfergus that could be seen as a forerunner of the Behan/O’Toole offering. Behan was not slow to claim authorship of songs so it is unlikely that he wrote it and then attempted to pass it off as a folk song. O’Toole had no song writing background so it’s unlikely that it had anything to do with him, which brings us back to the question, where did it come from? 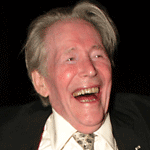 Did O’Toole preserve an otherwise forgotten song? It may be that O’Toole inadvertently helped to preserve a song that might otherwise have been overlooked and forgotten. If he did so, it’s likely that his memory may not have been all that accurate. One of the intriguing things for many people listening to Carrickfergus is that the lyrics don’t always seem to follow as might be expected – even allowing for the inconsistencies that often appear in folk songs that have been handed down as part of an oral tradition for hundreds of years. More about the meaning of the song.